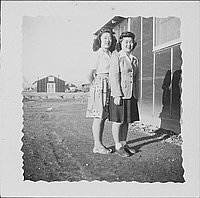 Full-length portrait of two women posed standing together on dirt next to barracks at Rohwer concentration camp, Rohwer, Arkansas, April 1944. Woman on L wears light-colored short-sleeved blouse, floral-patterned skirt, and sandals with socks. She stands slightly behind the other woman, with her hands behind her back. Woman on R wears light-colored jacket over blouse, dark skirt and shoes. Their shadows fall on the wall next to them at CR. Barracks in background at CL. Image has irregular scalloped border. 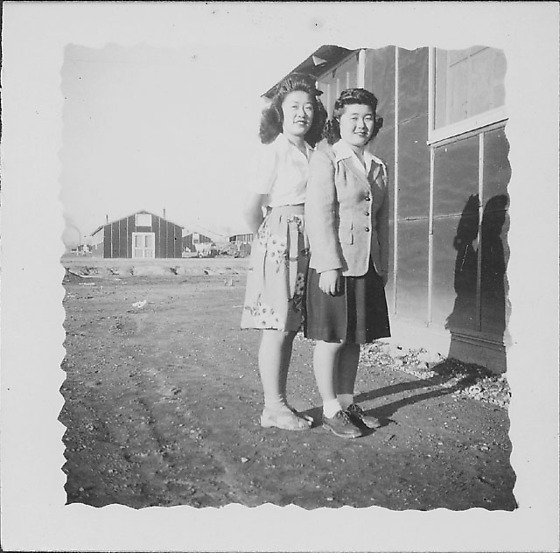 Written in pencil on back, T: April 1944.